Chapel of the Flowers is here to help you plan your Las Vegas wedding, including assisting you with obtaining your marriage license. I need a marriage license? Where are the forms? Where is the Marriage License Bureau? How much is a marriage license? These are all great questions that we have received from our couples over the years. Chapel of the Flowers is happy to instruct you on how to get married in Las Vegas. Instead of searching all over the web to find information about obtaining a Marriage License, we have put together an easy-to-use guide to help you file the paperwork and make your Vegas wedding official. You can also speak directly with our talented team of Wedding Planners for Las Vegas wedding information. Email us at marryme@littlechapel.com, toll free at 1-800-843-2410, or chat with us! Did you know the Clark County Marriage License Bureau allows couples to pre-register online? Get a head start on your pre-nuptial paperwork! Couples can go online 60 days prior to their wedding date, and fill out the pre-application form. This online form will save time at the clerk’s office when you go to obtain your marriage certificate. 1 Who Needs to Apply for a Marriage License? If you are planning a Las Vegas elopement or legal ceremony, you will need to apply for a marriage license for the government to recognize you as a married person. * You will not need a marriage license for vow renewal ceremonies, or commitment ceremonies. Commitment ceremonies are not recognized by the government as a legal marriage, and you will not be able to claim yourself as a married person. Both you and your fiancé can complete, and submit this online– version of theLas Vegas Marriage License Pre-Application Form. Keep in mind, you’ll still need to visit the Clark County License Bureau in person within 60 days of submitting your completed form to receive the paperwork to bring to the Chapel on the day of your wedding. If you filled out the pre-application, this is where you and your fiancé will go to pick up your license. 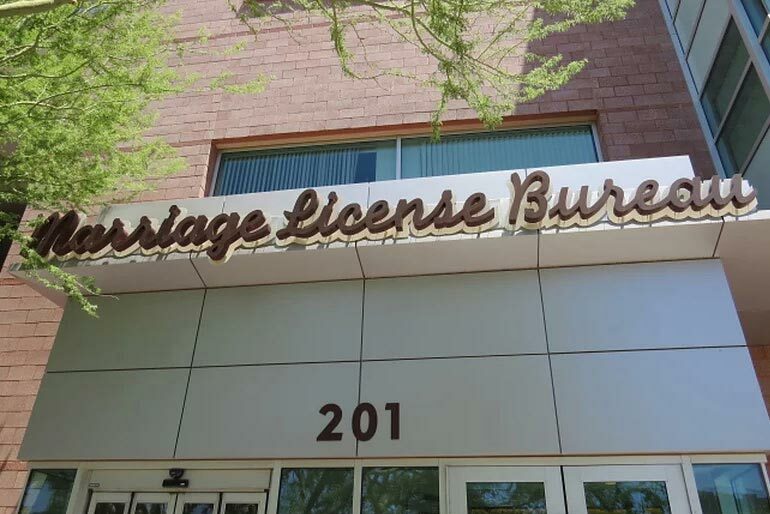 If you didn’t pre-register online, you and your fiancé can still complete the all forms in-person, and collect your marriage license at the Clark County Marriage License Bureau in Downtown Las Vegas. Both you and your fiancé must appear together at the Regional Justice Center within 60 days of your wedding date to retrieve your marriage license. * There is no appointment necessary to apply or receive your license. There are a couple of things to keep in mind when applying to get legally married in Las Vegas. The Marriage License Office is open 8 a.m. to Midnight every day, including Holidays (no appointment needed). Once you arrive at 201 E. Clark Avenue, the Regional Justice Center (where you will need to go) is located on the ground floor on the northwest corner of 3rd Street & Clark. Don’t want the hassle of transportation to the License Office? Chapel of the Flowers offers VIP transportation services to get your marriage license. Contact our Wedding Planners to book this service at marryme@littlechapel.com, toll free at 1-800-843-2410 or chat with us! Once you and your fiancé have gone over the registration process with the clerk’s office, you will be required to pay the $77 license fee. The Marriage License Office does not accept: traveler’s checks, personal checks, or business checks. Chapel of the Flowers advises all couples to be prepared with $77 in cash, or use a major credit card (VISA or AMEX) to avoid any delays. Please Note: Your marriage license will be prepared with your legal name, exactly as it appears on the identification you present. If you are a U.S. citizen, you will need to provide your social security number on the application (a social security card is not required). You'll need a witness at your wedding ceremony; Chapel of the Flowers is happy to provide a witness at no charge upon request. You must be at least age 18. At age 16 or 17, you can get married if you have written consent from one parent. Your parent may come in person or provide you with notarized written consent. For further information regarding age requirements, please contact the license bureau at (702) 671-0600. To get married in Las Vegas, you must be no nearer in kinship than second cousins, or cousins-in-law, and not have a living husband or wife. There is no blood test or waiting period in Nevada. You’ll be given your marriage license before you leave to Regional Justice Center, so what’s next? Once your marriage license is issued, it is valid for one year and there’s no waiting period before you can be married. Be sure to bring your marriage license, your I.D., and any other documents from the Marriage License Bureau to Chapel of the Flowers the day of your ceremony. After the ceremony, your officiant will file your marriage license paperwork to be processed by the Clerk’s office. The certified copy will be filed, and ready to order after 10 business days. Still Need Help with Your Marriage License? Contact our knowledgeable Wedding Planners at marryme@littlechapel.com, toll free at 1-800-843-2410 , or chat with us! Now that you have "tied the knot", you will need proof that you are married for taxes, name changes, legal forms, etc. Couples can order their Certified Marriage Certificate 10 business days after their wedding date by visiting the Proof of Marriage page on the Clerk’s website. For couples that live in countries that require an Apostille (in addition to the marriage certificate), you will need to first order the marriage certificate, and wait until you receive the certified copy in the mail. Once received, you will fill out the application on the Nevada Secretary of State website , and mail the completed form with the certified copy to get the Apostille. * If you aren’t sure if your country requires an Apostille for Proof of Marriage, here is a link to check. Chapel of the Flowers has Apostilles and Certified Copy Services available to expedite your post-wedding proof of marriage paperwork. Feel free to contact our Wedding Planners if you have any questions about Marriage Certificate Services. Once you have received your marriage certificate, US citizens can go to their local Social Security Office to start the process getting a new Social Security Card with their new last name. After getting your new Social Security Card with your married name, you can then go to the DMV to get a new driver’s license or I.D. card. Have the ultimate Las Vegas wedding! Chapel of the Flowers offers a variety of wedding packages to include everything you need to exchange your vows in Las Vegas. From our basic package to ceremony with reception packages; our wedding planners will help you design an elegant ceremony. 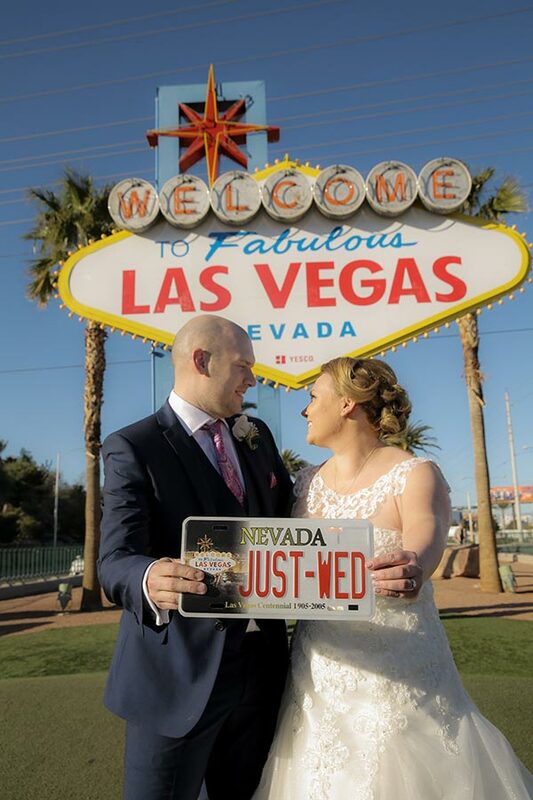 Click here to see all our Las Vegas wedding packages perfect for any budget. Make your wedding planning experience simple and stress-free, Chapel of the Flowers has been around for nearly 60 years, and has the knowledge and experience to plan your dream Las Vegas wedding, elopement, or vow renewal ceremony.